Autoblog's Noah Joseph was lucky enough to get some time in a diesel-powered 2014 Volkswagen Amarok Canyon in Deutschland. Sounds like the combination of German refinement and "truckliness" was to his liking. 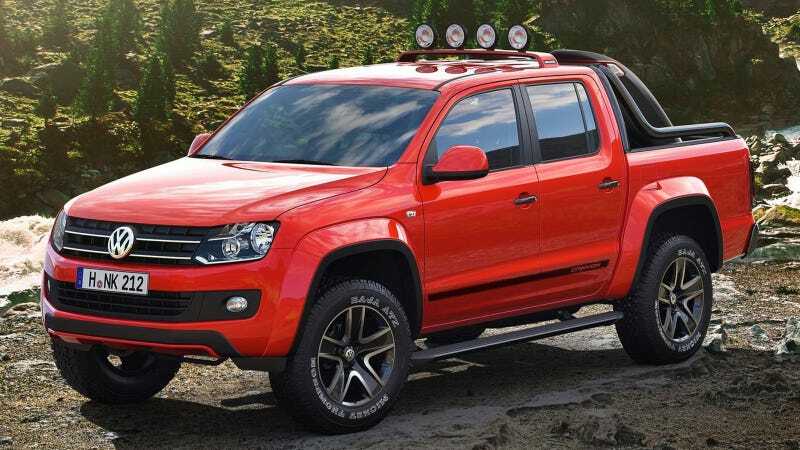 "[American and Japanese] trucks may be able to haul more than VW's, but if you've ever stepped into a pickup and felt a bit of a disconnect between the ruggedness of its construction and that of its fit-and-finish, the Amarok would likely surprise you with its German build quality..."
"What you shouldn't expect, however, is for the Amarok to drive like a Touareg with a pickup bed at the back. It's not a crossover – it's a truck, and it drives that way." Check out his full writeup right here.